As the largest provider of qualifications for 14-19 year olds in the Borough of Walsall, the college is typically supporting over 3,500 young people in accessing vocational courses each year. Providing training to over 4,000 adult learners, the college needed to create a focal point of information for its diverse student base while making use of already available content from other channels (i.e. their website and social media accounts) to simplify the process and keep costs down. They resorted to digitalsignage.NET to help them achieve this. 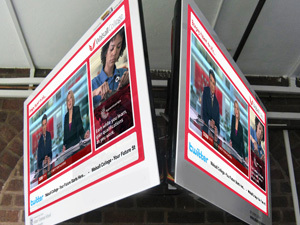 Walsall College uses digitalsignage.NET to send information to one or several screens around the campus installed by Chamber TV, keeping staff and students informed with minimum time and effort. Upcoming events, student achievements and other relevant news such as open days, skill competitions and business startup shows are advertised on screens in a variety of formats- from simple photos to HD videos and social media feeds. The flexibility and scalability that digitalsignage.NET offers allows Walsall College to grow its network at its own pace, while using their existing hardware and infrastructure. This entry was posted in and tagged advertising, digital signage, digital signage advertising, digital signage for education, digital signage software by Dynamax. Bookmark the permalink.